certificates copies, copy of PAN card and Aadhaar card and one recent Pass Port size photograph to the College email address or College address are given below. 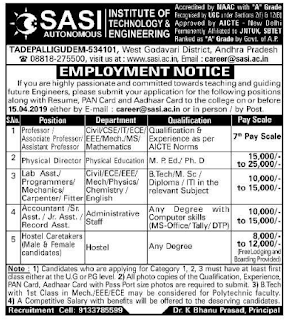 Further Details can refer http://www.sasi.ac.in/ Official Website. Required details like Salary, Qualification, and Application Procedure are given below. Physical Director: M.P. Ed, Ph.D. Lab Assistant/ Programmer/Mechanics/Carpenter/fitter: B.Tech/M.sc/Diploma/ITI Revelant Subject. Remaining Posts :Qualification is Any Degree. Eligible applicants can send Updated Resume with all Educational certificates copies, copy of PAN card and Aadhaar card and one recent Pass Port size photograph to the College email address or College address are given below.